Korean Ginseng, Lycium Barbarum (gojiberry) extract, grape seed extract, blueberry extract, ginkgo biloba extract. Combining best practices from Eastern herbal medicine and Western research, the Sagee capsule was developed after years of dedicated research by a team of scientists and herbal medicine specialists. SAGEE capsule is a pure natural herbal product extracted and refined through advanced GMP/ISO facility Canada. It is non-toxic, non-addictive and has no side effects. Sagee is 100% natural and it can be used by all age groups to maintain brain health. 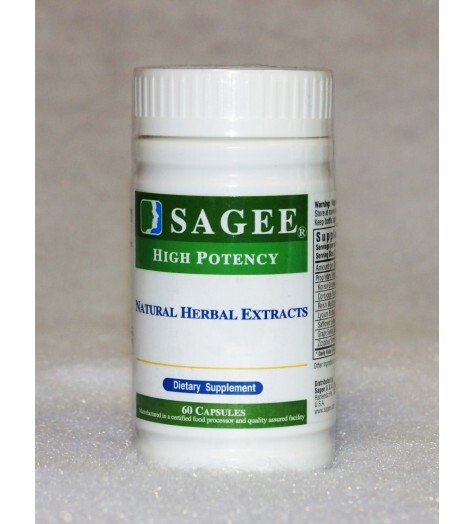 Sagee is not a specific medicine on any health conditions. It is a formula that is designed to balance the five elements in the body and enhance the communication between the body and the brain, by supplying the brain with more oxygen, more blood flow and more nutrition, so that the brain cells and benefit from a stronger body. This is like finding the back door to the brain through the arteries, not by forcing through the blood brain barrier which is very selective of what it allows into the brain. USAGE: Adults take two capsules twice a day, preferrably 15 minutes to half an hour before breakfast and before dinner. Since this formula is food based, all the items can be used as food. It can be used by all age group. Even if you are healthy, you can use it to delay the aging process. How long do I have to use it? There is no chemical dependency for this product. So you can choose how long you need to use it, depending on your budget. Some clinets use it for nearly ten years now and are doing very well with it. You can also stop using it any time. Or you can reduce the dosage to maintain. How many capsules in one bottle? There are sixy capsules in one bottle. Right now, we do not have it in liquid form.